All eyes are on the coming release of Solo: A Star Wars Story next week! The hype machine is in full swing with TV spots, short trailers, posters, promotions, and Donald Glover hosting Saturday Night Live back on May 5 (May the Fifth/"Revenge of the Fifth"). All signs point to this movie being a fun adventure, which I think is needed at this time after The Last Jedi and Rogue One were weighty entries into the saga. We're ready for a bright take on the galaxy before we have our long wait for Episode IX in December 2019. But during that long wait, there will be no shortage of Star Wars activity. Galaxy's Edge will have its opening sometime in 2019 (I'm predicting it will be May because of the 25th being the anniversary of the release of the original film). There hasn't been much new news in recent weeks about the park expansion. There is a video that shows some film footage to be used in the Millennium Falcon ride and which also demonstrates that the film is produced in real-time. This proves that the ride goes beyond the simple motion-simulation of Star Tours. Guests will really be able to control the actions of the Falcon and have it move within the environment on the screen instead of the predetermined nature of older rides like this. When you slow down, the progress of the visuals, slows down. When you turn left, it all turns left. It seems much more like a large-scale video game but in the immersive environment of the cockpit with all its controls, switches, and buttons. Just how much we can truly control will be interesting to discover. Can we launch into hyperspace whenever we want? Would we crash through the walls of some space station we're in? Can we shoot the laser blasters anytime and cause damage to whatever is in front of us? I'm thinking the replay value of this new ride will have us standing back in line numerous times… except perhaps during the opening days when I'm guesing that one ride would involve half a day of waiting in line. The Millennium Falcon continues to be the primary icon of Star Wars and both Solo: A Star Wars Story and its prominence in Galaxy's Edge will only increase that iconic status. The movie will certainly give us more of the ship's history, especially with its backstory of going through different owners, including the incomparable Lando Calrissian. "Solo: A Star Wars Story" | Tour The Millennium Falcon with Donald Glover. © Star Wars/Lucasfilm. Now that looks like one cozy ship! I always imagined the ship was scrictly for space travel and smuggling, but this looks like a place you could live in. Perhaps even the secret smuggling compartments were one of Han's modifications. Lando's version seems to reflect his cool nature. In this Falcon, you can take it easy and enjoy yourself. It mirrors some of the environment we see later in time when Lando is administrator of Cloud City—a beautiful location with the comforts of home. 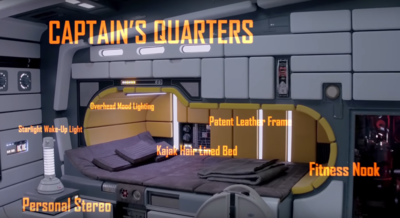 "Captain's Quarters" on the Millennium Falcon from "Solo: A Star Wars Story" as shown by Donald Glover in a Star Wars "tour" video on YouTube. Photo by Lucasfilm. Artist's depiction of a room at the Star Wars resort hotel. Photo by Disney. There are many aesthetic similarities, like the inset beds and surrounding technology. 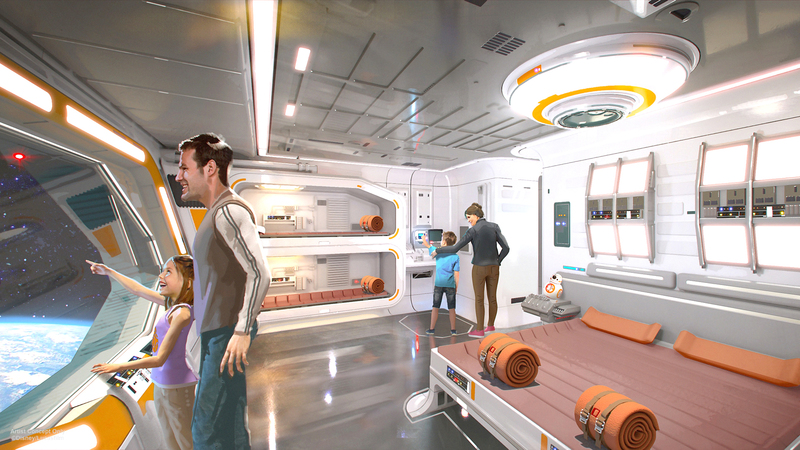 Disney Imagineers' goal of offering guests some very immersive experiences in Galaxy's Edge are really coming to fruition—it looks just like the movie. This makes me believe some designers across the spectrum of Disney and Lucasfilm are sharing notes and collaborating in order to make Galaxy's Edge feel quite connected to the realm of the movies. 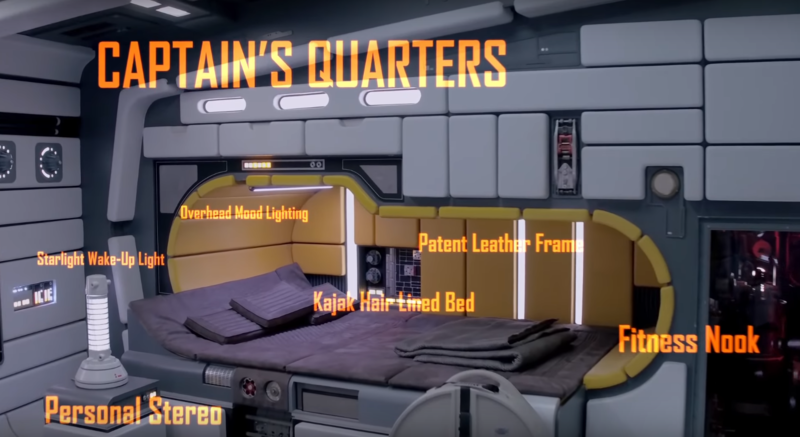 We'll get the fast exciting ride aboard Solo's Falcon, but we'll also have the coolest living spaces in the same galaxy. These rooms will be so Lando! 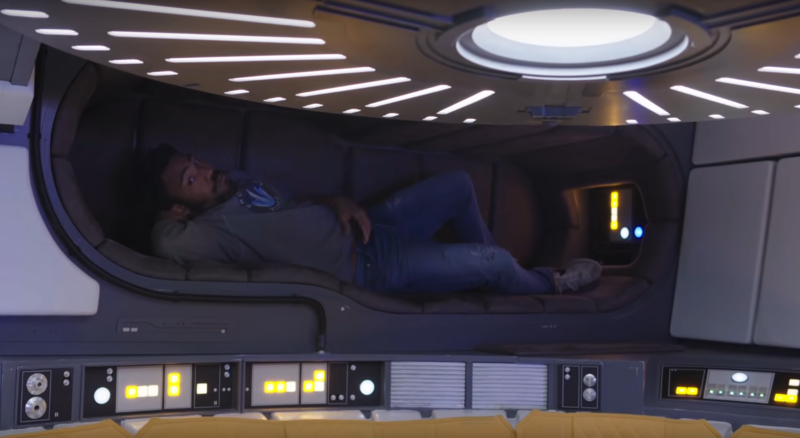 Donald Glover demonstrates the guest bunk on the Millennium Falcon during a "tour" video from the Star Wars YouTube channel. Photo by Lucasfilm. I'm so happy to see these designs from the movies "come to life" in the park. No details are being overlooked, and it's making me think that I need to start saving more for that eventual trip the edge of the galaxy. Maybe I need to up my game, find a high-stakes card game, and bet it all on a good hand. It's all about the movie we are about to see, and like I said, it is looking good to me. As a fan, we might have had a little worry a year ago when Lucasfilm changed directors of Solo and hired Ron Howard to take the helm. As a fan myself, I believe that ever since Ron Howard took the job, I have seen many positive things—including a quick nod to fan-favorite characters, Tag and Bink, who apparently will be canon with this new movie. Howard has a history with Lucasfilm since acting in George Lucas's film, American Graffiti and directing the Lucas-produced film, Willow. Finally, Ron Howard was featured in an interview on the "Star Wars Show." "Solo" director Ron Howard stops by to give Star Wars the Arrested Development treatment. © Star Wars/Lucasfilm. Using the Han Solo character, it sort of pushed things in an "adventures" direction. It's almost got a '70s feel: that rebeliousness, that recklessness, and so that's informed a lot of the action, it informed the way scenes are staged, the way the action's cut, the way it's shot, and you really feel that in the trailers as well. It's so full of adventure and twists and turns, but the plot is driven by character, and it is driven by this kind of discovery of what defined [Han], what began to define him. I think that's kind of a classic journey and a little different from Star Wars in that it's true to the galaxy and the spirit of it, and what we know and understand of it both tonally and in terms of the Empire and the power that controls things. But this isn't about a giant war. This is much more focused on, "What does all this mean for this young guy?" These side-story movies should be exactly this. They should not be about the giant wars, but about the personal stories and journeys of characters in this galaxy and how they're affected by those larger events. It's the kind of focus I don't believe The Hobbit movies took up—they instead stayed with the larger problems of the entire world and not the brave journey of one person who turned out to be much more than he seemed. I'm looking forward to the action and adventure of Solo, but it is the character and his story that excites me most.